Bringing Music City to Sin City for five-nights-only, world-class entertainers FLORIDA GEORGIA LINE elevates their revolutionary status with a limited residency on the iconic Las Vegas Strip. General ticket prices for FLORIDA GEORGIA LINE LIVE FROM LAS VEGAS start at $49, plus applicable tax and fees, and are available now online at SeatGeek.com or in-person at the Planet Hollywood box office. Shows begin at 8 p.m.
FLORIDA GEORGIA LINE LIVE FROM LAS VEGAS begins Saturday, Dec. 1 inside Zappos Theater at Planet Hollywood Resort & Casino. Surpassing 30 million tracks and more than 4.2 million albums sold worldwide, FGL remains the first and only Country act to achieve RIAA’s DIAMOND certification for their breakout “Cruise.” Their record-shattering career continues to crush colossal feats as their red-hot #1 crossover collaboration, “Meant to Be,” with Bebe Rexha, just hit 1 BILLION global streams while also topping the Billboard Hot Country Songs chart for 27 weeks. Their last album, PLATINUM-certified DIG YOUR ROOTS (BMLG Records 2016), jam-packed three consecutive #1 smashes: 4X PLATINUM-certified “H.O.L.Y.” and PLATINUM-certified hits “May We All” (ft. Tim McGraw) and “God, Your Mama, And Me” (ft. Backstreet Boys). The superstar duo obliterated genre barriers last year with THE SMOOTH TOUR 2017, as it featured sold-out stadium dates with special guests Hip-Hop icon Nelly and Pop idols Backstreet Boys. Tying for the most nods and scoring a prominent performance slot at the 2018 CMT Music Awards, FGL was nominated for: Video of the Year (“Meant to Be” – Bebe Rexha ft. Florida Georgia Line); Duo Video of the Year (“Smooth”); Collaborative Video of the Year (“Meant to Be” – Bebe Rexha ft. Florida Georgia Line) and CMT Performance of the Year (Backstreet Boys and Florida Georgia Line, “Everybody” from CMT Crossroads). Redefining what’s possible in Country music, global superstars Florida Georgia Line continue to push full-throttle into uncharted territories with history-making collaborations, fresh entrepreneurial ventures and bold new music while currently in the studio. Crushing record-breaking milestones, the MULTI-PLATINUM duo has heavy-hitting spotlights on Bebe Rexha’s “Meant to Be” [14th #1 overall as artists plus leads the Billboard Hot Country Songs chart for a 26th week – surpassing FGL’s own “Cruise” for the second-longest reign overall], Hailee Steinfeld & Alesso’s “Let Me Go” (ft. watt), Morgan Wallen’s “Up Down,” and The Chainsmokers’ “Last Day Alive.” Since 2012, FGL has earned prestigious honors from the AMAs, ACM Awards, CMA Awards, Billboard Music Awards and CMT Music Awards. As true visionaries, FGL’s innovative endeavors include their own Old Camp Peach Pecan Whiskey, the newly announced multifaceted compound in Nashville: Tribe Kelley Trading Post, Tree Vibez Music, and meet + greet and FGL HOUSE. 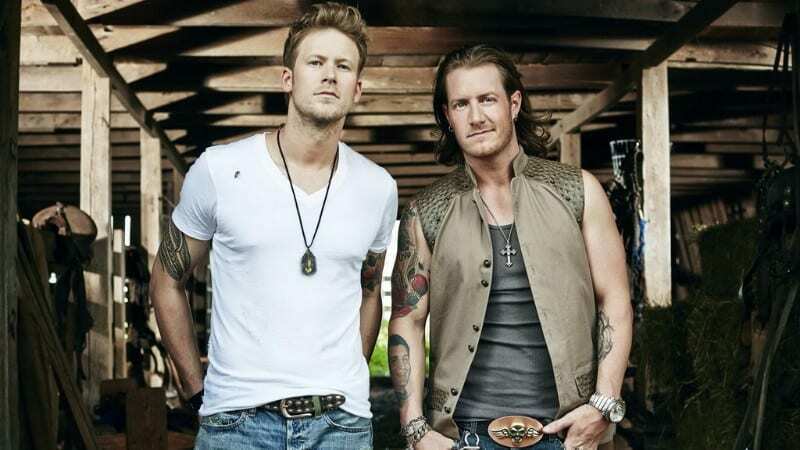 In addition to their supercharged music festival appearances this year, they will kick off the inaugural FGL Fest with a concert inside Turn 4 of the historic oval during the Indianapolis Motor Speedway’s 25th annual NASCAR weekend on September 8.